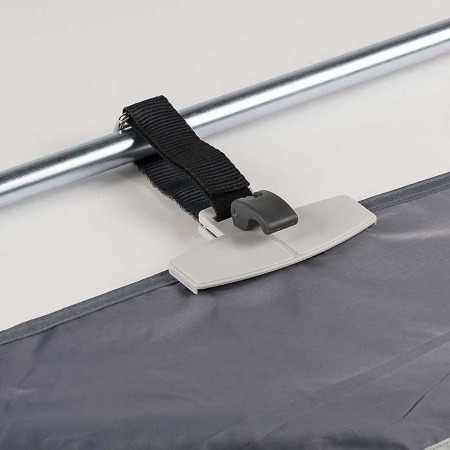 The Kampa Awning De-Flapper is a great gadget that will help stop your awning flapping in the wind thereby preventing unnecessary noise and damage to your awning. The clamps are constructed using a light grey plastic. These pieces are held together by a metal pin and dark grey plastic clamp. Inside each clamp are four non-marking black rubber grips to protect the awning fabric and prevent it slipping. The grips are approximately 3cm x 5cm in size. 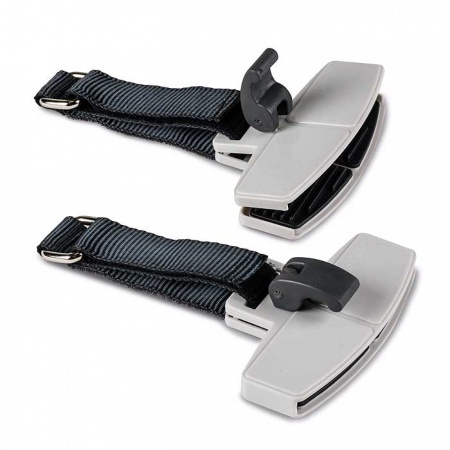 The clamps each come with a black nylon strap to attach clip to the awning. The strap is approximately 32cm in length, 16cm when doubled over and attached. It is lined with velcro in order to fasten it. There is a square metal ring at one end to feed the strap through. Quantity: 2 clamps and 2 straps per pack. Attachment: Easy to attach to awning. Grip: Non-marking grips protect the fabric.